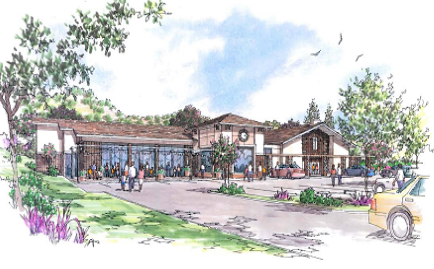 Wondering about the progress of theproposed community center? Don't know anything about the proposed community center? We will be hosting an informal informational wine and cheese gathering onWednesday 10/12from5-7pmin the hall. I will give a brief 5 min overview at5:15 and 6:15and then school parents and myself will be available to answer any questions you may have about this facility improvement that will greatly enhance so many of our school programs. Congratulations to Mr. Danny Hauger and his wife Jessica on the birth of their daughter Dana last Wednesday night. According to Mr. Hauger, everyone is doing well and he will return to schooltomorrowand be ready for his scheduled parent conferences. Each year, St. Perpetua School offers a parent education night to assist parents with navigating the ever-changing world of technology. 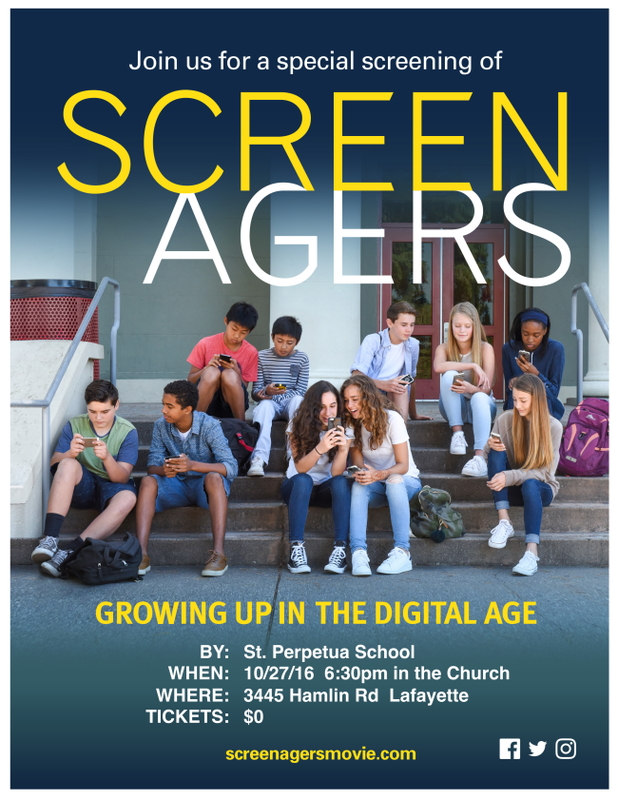 OnOctober 27at 6:30pm, we will be hosting a screening of the documentary,"Screenagers: Growing Up in the Digital Age". This movie explores the affects and impact of various types of screen time in our society. I was able to attend a viewing of Screenagers a few weeks ago and I strongly encourage all Jr. High parents to attend. Please let me know if you have any questions. Finally, I am away for the rest of the week attending the annual Diocesan Administrators' Conference. This conference provides dedicated time with elementary, high school and Department of Catholic Schools colleagues to learn and collaborate. School picture re-takes will be onWednesday, October 12.If your child was absent on 9/8 or if you wish to have the photo taken again, forms are in the office or can be accessed online atwww.mylifetouch.com.Our school picture day ID isBY116048Q1. We will hold our annual disaster drill onFriday, November 4th.Although we hope to never need to implement these procedures, it is imperative that we all review and practice the various aspects of the plan.On that day students are picked up between11:15 and 11:45in the new plaza area at the end of school building near the cross walk. Students will only be released to those listed on their student profile and ALL adults MUST show their ID.If someone other than the parent or another personalreadyon your Emergency/Authorized Pick-up list will be picking up your child on the day of the Disaster Drill, please email the office with that authorized person's name.Panther House is closed that afternoonso that we can review drill as an entire staff. School-Time Accident Insurance is a optional insurance plan administered by Meyers-Stevens & Toohey.If you are interested in getting more details on this optional plan, brochures are available in the school office. There arefour Sign-Me-Up partiesstill open for registration!It's a great way to get involved withthe school community and it supports our Parent Association fundraising efforts. Dad's CornholeThisFridayevening,October 7th~ Last chance to sign up for a greatevening of food, beverages and fun!Clickhereto sign up. Clickhereto get additional information and sign up for these events. 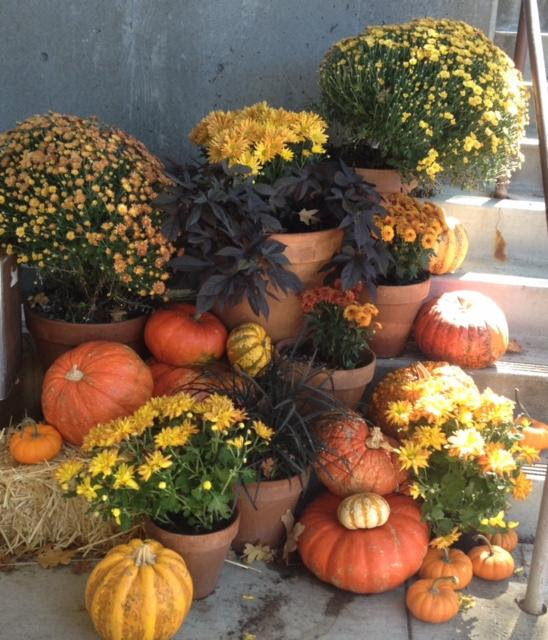 We are celebrating all things fall with seasonal delights atCafe` Perpetuathis Friday!We will have pumpkin scones, pumpkin breads, pumpkin cheesecake bars, gluten-free pumpkin muffins, apple pocket pies, apple cider donut muffins and more! We look forward to seeing you at the cafe`, and thank you for supporting your children's Garden of Learning! Get ready for our annual'Mixed Bags' salea very popularStudent Council fundraiser.Beautiful reusable bags, gifts for the upcoming holidays, and so much more! Packets will be coming home next week with your students. 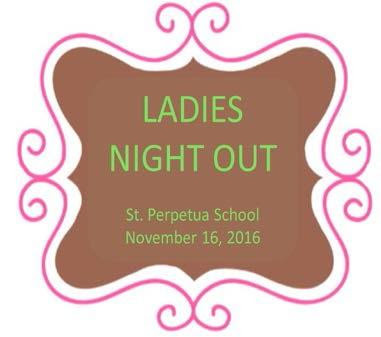 Please join us for our4th Annual Ladies Night Out and Holiday Boutiqueto benefit St. Perpetua School. Don't miss your chance to enjoy drinks & appetizers with friends while getting a head start on holiday shopping from an amazing array of local vendors. If you haven't experienced this event yet, don't miss out this year!We sure hope you can join us onNovember 16for the 4th annual Ladies Night Out and Holiday Boutique. Please seeattached flyerfor more details. Our annualScholastic Book Faireis happeningOctober 17-21.Seeattached flyerfor more details.This Faire is a very popular event for both students and parents.Books and other gifts are available to help you get an early start for your home library or holiday shopping. October 28:(3:30 to 4:15) Special Halloween treats, face-painting and Halloween activities like pumpkin bowling. Email me if you would like your child to have their face painted and they will be the first to get theirs done. October 31:Halloween;noondismissal. Children will be dismissed after the Halloween Parade.Panther House isclosed in the afternoon. If your Jr. High Student is looking for service hours, we would welcome them onOctober 28to come help decorate faces or run activities after school. There are 6 spots available on a first come, first served basis. Our Hot Lunch program is run by Food For Thought.Clickherefor the program information or see 'This Week's Flyers'. Scrip Family Reportsare coming outnext week. This is a great opportunity to contribute to the school while doing your regular shopping. No extra money out of pocket towards school fundraising. Plus, if you exceed your family quota, you will earn tuition credit. Also:TheScripNow Playstation Plus & 1-year membershipin now only$59.99!